Croydon North MP Steve Reed dropped in to meet local pharmacist Dr Patel to hear about Tory plans to slash funding for pharmacies by £170million. The Tory plans will mean local community pharmacies like Dr Patel’s in Thornton Heath will have to cut back on staff and services or even close their doors for good. 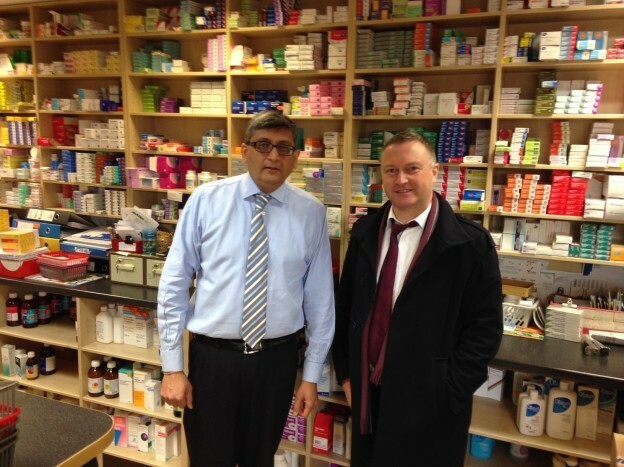 Mr Patel’s Brigstock Pharmacy has been serving Thornton Heath for over 30 years. In that time he has helped residents by dealing with ailments like high blood pressure, eye infections or skin rashes, advising on sexual health concerns, and helping people stop smoking – as well as his core business of dispensing prescriptions. Following the meeting, Mr Reed has written to all the community pharmacists in Croydon North asking them to co-sign a letter with him calling on the Government to rethink their dangerous plans.